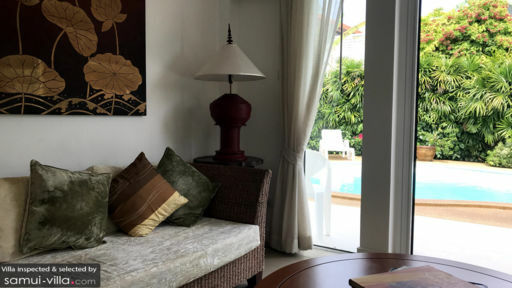 White House by the Beach is a spectacular holiday home that stays true to its name providing uninterrupted and easy access to pristine white sandy shores of Hua Thanon beach, Koh Samui. 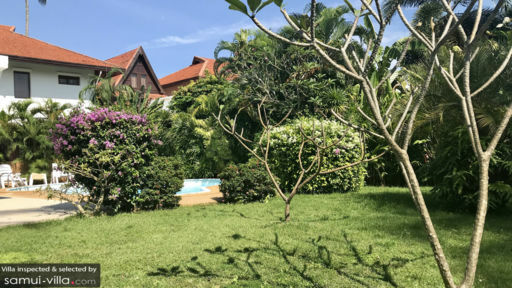 The property has been designed amid tropical gardens that grow wild and free with blossoming bougainvillea flowers, thick and dense trees, and trimmed hedges for a put-together landscape. The interiors with the living and dining areas, three bedrooms, and more match the exterior when it comes to homely warmth and an inviting ambiance. The quiet surroundings and privacy help you to unwind and rejuvenate in a healthy manner. 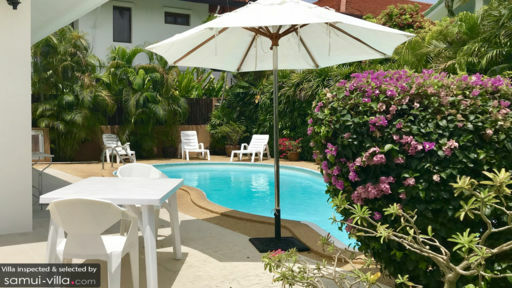 The villa is home to three bedrooms that are air-conditioned and furnished with king-sized beds. The dark wood furniture adds a luxe and vintage ambiance to each space especially with minimal décor and simple things. Glass doors or windows offer pleasing views of the outdoors so you can enjoy the luscious nature even while lounging on your bed. The bedrooms even come with ensuite bathrooms that have been fitted with necessary amenities and shower areas. The peanut-shaped swimming pool is perfect for a swim or to just soak your feet while basking under a tropical sky. Fragrant flowers and luscious flora dominate your view so you can enjoy an immersive experience into nature. There are white outdoor chairs that recline slightly for a nap or to curl up while hanging out with loved ones. Outdoor dining is possible as there is an alfresco area beside the pool. Once the sun sets, you can enjoy a few evening drinks and some tasty appetisers. Glass doors lead you to the main living area that is the central room at White House by the Beach. Decorated tastefully with a classic feel, the living room is breezy, light, and instantly inviting. Comfortable seating allows you to take rest whenever you desire and even watch some television in the comfort of your own space. There are a few magazines to keep you company or you could always explore the nearby towns for a more active time. The living room extends to incorporate the dining area with a six-seater dining table that has an antique concept for a more laidback and old-school vibe. You will feel right at home at the White House by the Beach. An open kitchen fitted with all modern appliances and an island in the centre is found in the far corner of the living room. You have everything from a refrigerator to a microwave so you can prepare anything you wish to eat. Simply enjoy a lazy afternoon at your beach villa with the fresh tropical breeze, open skies, and the quiet sounds of nature as your companions. As guests of White House by the Beach, you are entitled to first-class amenities and services provided by a trained staff. They include round the clock security, housekeeping & maintenance, and management of the property. Certain additional services are offers on an extra cost including the use of a tennis court, car rentals, scooters, and airport transfers. Samui is known for its pristine beaches with glistening white sand and azure waters that beckon from afar. The advantage of staying at this villa is that you have complete access to the beach which is only a short walk directly from the front gate. For further activities, there is the Samui Aquarium nearby where you can learn more about marine life in the tropics. Restaurants, beach bars, and cafes can be found nearby if you wish to dine outdoors and relish the local food.